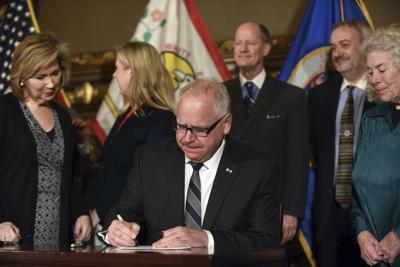 Governor Tim Walz last week signed Executive Order 19-24, affirming the government-to-government relationship between the State of Minnesota and Minnesota’s eleven tribes. Building on previous executive orders on such tribal relations, Governor Walz’s order applies to all state agencies and was made in consultation with both agencies and tribal governments as it was written. “Meaningful tribal consultation is foundational to recognizing and supporting the sovereignty of Tribal Nations. Executive Order 19-24 expands the framework established by the Dayton Administration to build positive and lasting relationships with Tribal Leaders, and further strengthens the state’s commitment to working with Tribal Nations on a government-to-government basis,” said Robert Larsen, President of the Lower Sioux Community. Affirms that the State of Minnesota recognizes and supports the unique status of the Minnesota Tribal Nations and their right to existence, self-govern, and possess self-determination. Directs state agencies to recognize the unique legal relationship between the State of Minnesota and the Minnesota Tribal Nations and respect the fundamental principles that establish and maintain this relationship. Requires all state agencies to designate Tribal Liaisons that will be able to directly and regularly meet and communicate with the Agency’s Commissioner and Deputy and Assistant Commissioners in order to appropriately conduct government-to-government conversations. Mandates tribal-relations training for all state leaders and other employees whose work may impact Tribes.